Dirty finger nails, starry nights, flickering camp fire, and S’mores… camping is a summer tradition and one I look forward to each year. Once the weather warms enough to venture into the high country for a bit of peace and quiet we pack up our tent, camp stove and sleeping bags for free and filthy fun. The 4th of July weekend was our maiden voyage this year. We're staunch tent campers as it allows for the purest wilderness experience. The beauty of camping, for me, is connecting with nature. We set up camp at an impromptu spot in a national forest, beside a babbling brook, under quaking aspen trees and stately pines; away from the clamor of the city…it was blissful and restorative. 1- Backpacking and camping in a tiny red tent throughout Europe. My very favorite camping was while backpacking in Europe. My husband and I were there for three months with very little money. Rather than shortening our trip due to dwindling funds, we were frugal with our accommodation. 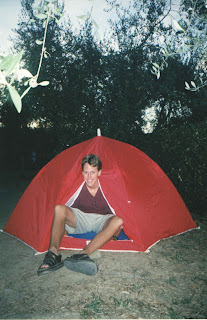 We purchased a small red tent in Florence, Italy and stayed in our little casa throughout our continental travels. We scorched in Rome’s summer heat, froze amidst Amsterdam’s heavy rains and experienced everything in between. While definitely not the most comfortable way to travel, we saw Europe and were able to stay for an entire summer. We met incredible people and had the freedom to roam without needing hotel reservations or plans of any kind. 2- Camping Along the C&O Canal. Several years ago we camped along the C&O Canal with a group of good friends. We hiked in a couple of miles, along a dusty trail and stayed along the banks of the canal in Maryland. We jumped in the cool waters and retreated from the muggy summer heat. We floated carefree along with the currents for miles downriver. We hiked back to camp, made dinner together, shared stories late into the night, and made unforgettable memories. 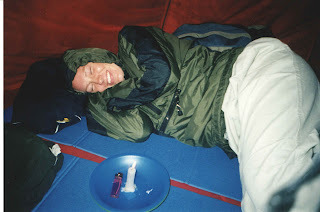 Camping is an activity best shared with good friends- especially hilarious, fun-loving, adventurer types. Thanks Chip and Jean! 3- San Juan Whitewater River Rafting. 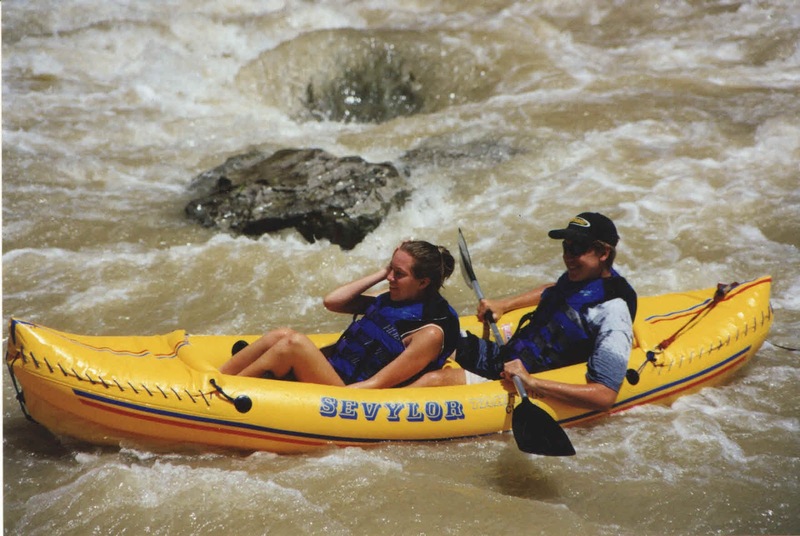 My most precious camping memory is with my husband and father-in-law while rafting the San Juan River, a tributary of the Colorado River. We started the eighty-four mile trip in Bluff and ended in Mexican Hat, Utah. 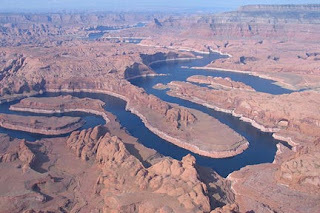 Each day we rafted the meandering whitewater and lively currents along the most breathtaking scenery of the American Southwest. We paddled past rainbow colored rock and floated over glass-like polished limestone pools. A stray dog, that we affectionately named Juanita, followed us for four days as if even she knew what fun we were having. As we floated in our little yellow kayak ducky, the sound of our laughter reverberated off those high canyon walls. We laughed so hard that if you listen very closely it echoes even still, imprinted on those chasms forever. There’s a sense of permanence, unity, and everlasting happiness that I took from the time we all spent together on the San Juan. The trip was ephemeral but the memories will last my lifetime. Adventure is in my blood. When I seek some place for adventure, I always go for hiking, camping flying and other so-called extreme sports. I think you had enjoyed a lot during your trip. Thanks for reminding my memories of Stockholm holidays. I must say " you had really nice and rocking time in your trip because your photos says you had great time, Thanks for sharing your great time. I thoroughly enjoyed reading your blog because i love to read post like this and i already bookmark you blog to get more exciting post. My precious camping memory is with Friends because last summer we had gone Australia and That time we had really awesome time.Thanks for sharing your great and valuable time. It would be appreciable if you can please remove my link along with anchor text: Villas Toscane from comment done with name: john cenna.